As a florist, social reformer, teacher and best-selling author, CONSTANCE SPRY (1886-1960) democratised home-making in mid-20th century Britain by teaching millions of people that – with a little imagination – they could beautify their homes with flowers plucked from hedgerows and scraps of wasteland. Few people have had such a powerful influence over the way we decorate our homes as Constance Spry. First as a teacher and social reformer, then as a society florist and best-selling author, Spry (1886-1960) taught mid-20th century Britons how to beautify their homes with such unassuming materials as berries, vegetable leaves, twigs, ferns and weeds displayed in a motley assortment of containers from gravy boats and bird cages, to tureen lids and baking trays. A household name in the UK throughout the 1930s, 1940s and 1950s, Constance Spry was then regarded as a quaintly anachronistic, if not obscure figure. Yet her influence as a home-maker and social reformer has endured in the do-it-yourself creative spirit of such diverse institutions as art schools and the Women’s Institute. Born in Derby in 1886, Constance was the eldest child and only daughter of George Fletcher, an ambitious railway clerk, and his wife Henrietta Maria. George studied hard to become a civil servant and the Fletcher family moved to Ireland, where Constance studied hygiene, physiology and district nursing. After lecturing on first aid and home nursing in Ireland, she married James Heppell Marr in 1910 and moved to Coolbawn, near Castlecomer, where she developed a passionate interest in gardening. When World War I began in 1914, Constance became secretary of the Dublin Red Cross. Two years later she left Ireland and her unhappy marriage with her son Anthony to work in welfare in England. In 1921 Constance was appointed head mistress of the Homerton and South Hackney Day Continuation School in east London, where teenage factory workers were sent to be educated one day a week. Intent on teaching them practical skills, Constance began with cookery and dress making, but soon noticed how much pleasure her students derived from the simple posies of flowers, such as violets or peonies, that she brought to school. At that time, flowers were the preserve of the wealthy, who could afford to buy cut flowers, and middle class families with large gardens. Constance taught her students that everyone’s lives could be enlivened by flowers, even in the poorest homes, and that all you needed was imagination, not money, to create a flower arrangement, which would be all the more satisfying if you made it yourself. In 1926 Constance married her second husband Henry Ernest Spry, known as Shav, who encouraged her interest in gardening and flower arranging. By then she accepted commissions to arrange flowers for friends’ dinners and parties, often using wild flowers and containers she unearthed in antique shops. After securing a regular order from Granada Cinemas, she caused a sensation in fashionable society by creating an exquisite arrangement of hedgerow flowers in the windows of Atkinsons, an Old Bond Street perfumery. Emboldened by her newfound fame, Constance gave up teaching in 1928 to open a business – Flower Decorations – at 7 Belgrave Road on the border of Victoria and Pimlico. Inspired by 17th century Dutch flower paintings and her growing collection of 18th and 19th century flower books, Constance developed a simple, yet visually arresting style of arranging flowers in solid blocks of colour and fluid forms with each arrangement customised to its surroundings. Together with friends such as the decorator Syrie Maugham, famed for the then-radical all-white drawing room she created for her Chelsea home in 1932 and the artist Hannah ‘Gluck’ Gluckstein, Constance defined a modern style and attracted chic clients, such as Princess Marina and the Duchess of Windsor. When she opened a larger shop on South Audley Street in Mayfair in 1934, Constance employed 70 people and, in the same year, published her first book, named Flower Decoration, after her business. At a time when floristry was one of the few trades available to young women, Constance helped them to learn their chosen trade through structured training by founding the Constance Spry Flower School at her new premises. Flower Decoration was the first of the thirteen books which would make Constance Spry famous. Inspired by a late 19th century book on flower arranging and garden management that she was given as a child, Constance wrote in a pragmatic, no-nonsense style based on her love of flowers and the knowledge acquired in years of working in her own gardens and reading about gardening. By explaining how the plants and weeds of each season could be used to enliven the home, she turned flower arranging into a democratic art. Constance’s books were packed with practical tips from singeing the tips of wilting poppies and remembering to remove lilac leaves, to polishing ivy leaves with glycerine and securing stems by jamming them into thin wire with a wide mesh. 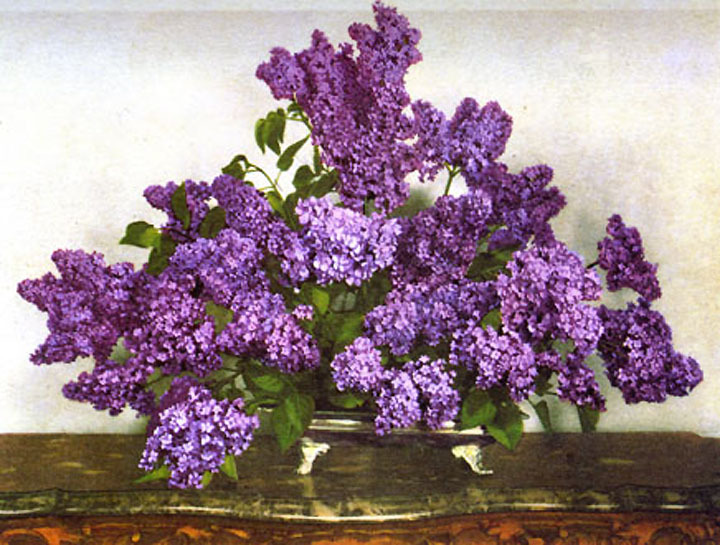 She loved to specify exactly which type of flower should be used in a particular arrangement, but also encouraged her readers to improvise by framing iris stylosa with a branch of alder, pompom dahlias with strawberry leaves and once filling a vase with curly kale leaves. She was equally keen on raiding attics and kitchen cabinets for baking trays and tureen lids to use as makeshift vases, but also commissioned the Fulham Pottery in London to create a bespoke collection of containers as well as ordering a series of ‘half’ birdcages, after seeing how beautifully flowers were arranged in them in Paris. As well as working closely with photographers to ensure that the colour images in her books were as accurate and evocative as possible, Constance later forged an enjoyable collaboration with the illustrator of her correspondence course to create witty sketches of Mrs Spry busying herself with her flowers. Constance’s books were published all over the world and in 1938 she was invited to open a flower shop in New York. When World War II began the following year, she resumed her teaching career and lectured to women all over Britain. In 1942, she published Come Into The Garden, Cook hoping to help the war effort by encouraging the British to grow – and eat – their own food. After the war, she opened a Domestic Science School with a friend and accomplished cook, Rosemary Hume, at Winkfield Place, near Ascot in Berkshire. In 1952, Constance was commissioned to arrange the flowers at Westminster Abbey and along the processional route from Buckingham Palace for Queen Elizabeth II’s coronation. The Winkfield students were asked to cater a lunch for foreign delegates for whom Hume invented a new dish – Coronation Chicken. At Winkfield Place, Constance combined her love of teaching with writing and indulged her obsession for antique roses, by devoting years to the cultivation of particular varieties. In 1956 she and Hume published the best-selling Constance Spry Cookery Book, thereby extending the Spry style from flowers to food. Early in 1960, she slipped on the stairs at Winkfield Place and died an hour later. Constance Spry’s books remained in print for many years after her death and her floristry business thrived, but her most important legacy was to teach millions of people how – with a few flowers and a little imagination – they could improve the quality of their daily lives by becoming, as she put it in the sub-title of her 1957 book, “A millionaire for a few pence”.